Sometimes antiques collectors are attracted to the unusual and buy items that are whimsical, unique or odd. Check out Kovels' list of the Top 8 “out of the ordinary” items that sold in 2017. Collectors are drawn to the items they collect for many reasons—usefulness, artistic value, historical or cultural significance or nostalgia. They collect glassware, pottery, toys, tools, silver, prints or figurines. But sometimes collectors are attracted to the unusual, and they buy items that are whimsical, unique or odd. The experts at Kovels announce their list of the Top 8 “out of the ordinary” items that sold in 2017. 1. A gold necklace with real hummingbird heads was a stunner at the spring 2017 Chicago Antiques + Art + Design Show. It was swag-style with three actual hummingbird heads with glass eyes. Their beaks protruded from the 14-karat gold frames. Made in England about 1885-90, asking price at the show was $36,000. 2. An old trunk for transporting human blood sold for $393 at auction in Ohio. The lined 23 by 22-inch trunk with metal brackets was marked “Transporting Human Blood, This End Up, Human Blood, Keep Cool, Must Not Freeze.” We knew one like it caused a rushed delivery from airplane baggage. 4. An unusual garden entranceway made from whale rib bones interested bidders at a spring garden and architectural auction in Philadelphia. The unique two-rib arch brought $8,500, well past the $600 to $900 estimate. The 146-inch-high arch was from a New Jersey estate. 5. Two amputation kits used by a Revolutionary War surgeon who served in the Continental Army sold together for $104,147 at auction in Boston. They had been owned and used by Dr. John Warren, an Army surgeon who saw action at the the Battle of Lexington and Concord. Dr. Warren became a founder of Harvard Medical School in 1782. Odd, but great historic items. 6. A Victorian diorama of two taxidermy squirrels playing cards at a table sold for $4,012. Taxidermists in the 19th century created imaginary scenes to display. This entertaining diorama is 15 inches high by 18 inches wide. It sold at a June 2017 auction in New York. 7. A phone used by Adolph Hitler during World War II was auctioned in Maryland. The winning bidder paid $243,000. The red Siemens dial phone originally had a black Bakelite body and had Hitler’s name engraved on it. It was found in his bunker in Berlin after the war and given to a British officer. 8. Two new but crumpled “19th-century” porcelain vases looked in bad shape at a summer auction in Ohio. But the unique vases were artwork made by Steven Y. Lee. They captivated the collector who paid $14,300. The vases are 23 inches high and decorated with cobalt inlay and decals. Terry Kovel is America’s foremost authority on antiques and collectibles. She is the well-known columnist and author of more than 100 books on antiques and collecting. The 2018 / 50th anniversary edition of Kovels’ Antiques & Collectibles Price Guide is currently available at Kovelsonlinestore.com and local bookstores. Terry Kovel will discuss antiques and collectibles topics with accredited media. Photographs are available. Contact pr(at)kovels(dot)com. 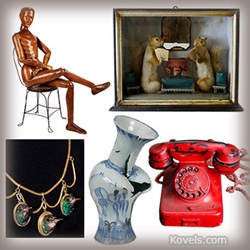 Kovels.com, created by Terry Kovel and her daughter, Kim Kovel, provides collectors and researchers with up-to-date and accurate information on antiques and collectibles. The company was founded in 1953 by Terry Kovel and her late husband, Ralph. Since then, the Kovels have written some of America’s most popular books and articles about antiques, including the best-selling annual Kovels’ Antiques & Collectibles Price Guide. The website, Kovels.com, online since 1998, offers more than a million free prices, and includes a free weekly email, “Kovels Komments.” It gives readers a bird’s-eye view of the market through the latest news, auction reports, a Marks Dictionary, readers’ questions and answers and much more.